NOW THEREFORE PLEASE TAKE NOTICE that after due consideration and deliberation, the Board of Trustees duly adopted said local law. A complete copy of the local law, the new Village of Churchville Code Zoning Code (Chapter 250) as adopted and the official zoning map of the Village of Churchville are available for inspection at the Village of Churchville Office 23 E Buffalo Street, Churchville, NY 14428 during regular business hours. Click here for the Appliance Rebate Form. For best quality, please download the form before printing. Please take notice that the Annual Financial Reports for the fiscal year March 1, 2016 – February 28, 2017 for the Village of Churchville are on file in the New York State Office of the State Comptroller and at the Village Clerk’s Office, 23 E Buffalo Street, Churchville, NY and are available for inspection during regular office hours. For up to date information on the Black Creek Trail Feasibility Study click here. 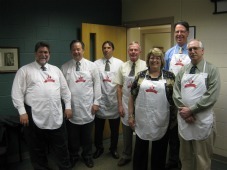 Mayor Nancy Steedman participated in the Mayors for Meals on Wheels on March 21, 2012. 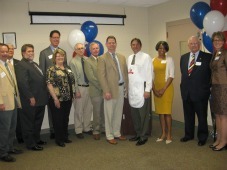 She joined other Mayors and Town Supervisors from Monroe County by touring the facility on Prince Street in Rochester. Then the elected officials donned aprons, hair nets and rubber gloves to assist in filling containers of food for delivery. Mayor Nancy joined with Town of Chili Supervisor, Dave Dunning to deliver meals to several residents in the area. This is a service provided to our residents that is beneficial in many ways. The organization and volunteers should be commended for their work in making this program so successful. Star of the West Celebrates 200 years!